Gaia Fast Deployment mechanism called "Blink" allows users fast and easy deployment of cleanly installed Check Point Security Gateways and Security Managements. Upon completion of the deployment process, user gets a cleanly installed machine (with completed First Time Configuration Wizard), desired Hotfixes, and updated signatures for Software Blade installed. For deployment procedure, refer to sections "(7) How to use the Blink mechanism" and "(8) How to configure the Blink mechanism". Important Note: Blink mechanism is intended only for cleanly installed machines - Check Point appliance, on which Check Point software has been installed (new Check Point appliance, or after restoring to factory defaults), but the First Time Configuration Wizard has not been run yet. Added support for Check Point R80.20. New Security Management images aligned with answers.xml file version 1.1 were added. All updated Security Gateway public images have the new answer.xml file format. This section provides the links to all the relevant downloads. Software Subscription or Active Support plan is required to download these packages. The following images were removed from this article. Contact Check Point Support to obtain the archived images. Additional Blink Images will be added when they become available. To check if a custom Blink image that includes specific ad-hoc hotfixes can be created, you can contact Check Point Support. Blink utility - The main utility that extracts the Blink Image and other packages, and installs them. Blink Image - The Gaia OS image. For details, refer to section "(5) Blink image". updated signatures for Software Blades. For details, refer to section "(6) Blink image updates". drwx------ 6 admin root 4.0K Sep 17 04:48 .
drwx------ 4 admin root 4.0K Sep 17 04:48 ..
1 BlinkInstaller Main executable file that extracts and installs all the packages. 2 BlinkInstaller.config Main configuration file. 3 BlinkInstaller.sha256 Check Point Signature file for the BlinkInstaller file (internal). 4 CheckPoint_Gaia_fd.tgz This is the actual installation image. 5 CheckPoint_Gaia_fd.tgz.sha256 Check Point Signature file for the installation image CheckPoint_Gaia_fd.tgz. For details, refer to section "(5) Blink image updates". answers.xml - User's configuration file for unattended installation. fd_wizard_gateway.sh - (Internal) Shell script for unattended First Time Configuration Wizard. fd_wizard_gateway.sh.sha256 - (Internal) Check Point Signature file for the fd_wizard_gateway.sh script. refer to section "(8) How to configure the Blink mechanism -> The answers.xml file". 8 manifest.xml XML-based file that represents the structure of the Blink package (internal). 9 manifest.xml.sha256 Check Point Signature file for the manifest.xml file (internal). executed and installed during the main installation process (after the reboot). (refer to section "(8) How to configure the Blink mechanism -> The answers.xml file"). Blink image updates is a separate package called blink_updates_<OSVERSION>.tgz. 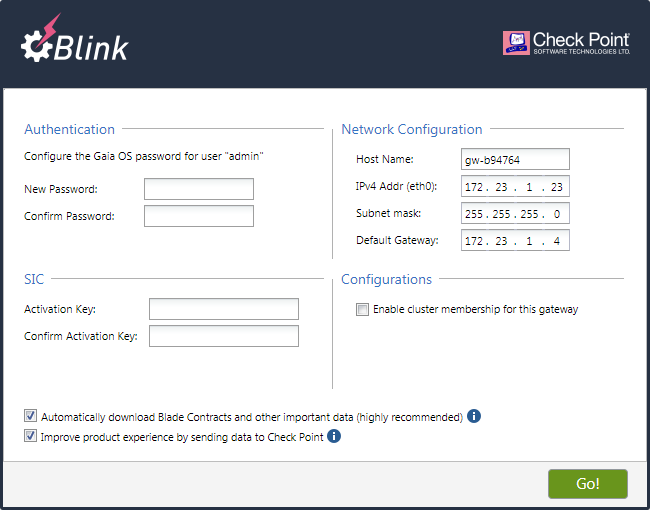 Important Note: Blink mechanism is intended only for cleanly installed Check Point appliances, on which Check Point software has been installed (new Check Point appliance, or after restoring to factory defaults), but the First Time Configuration Wizard has not been run yet. Download all the required (and optional) files from the "(4) Downloads" section. Transfer all the files to the appliance (to a newly created directory). Execute the Blink utility (reboot will be performed automatically). Connect with your web browser to the Check Point appliance to complete the First Time Configuration Wizard. Connect to the command line on the Check Point appliance. Transfer all the files from your computer to the newly created directory on the appliance. Either transfer the files over SCP (recommended). Or transfer the files to a USB storage device and mount it on Gaia OS. Note: This requires working in the Expert mode. In addition, refer to sk31657. -i <path to Blink Image> Specifies the path to the Blink image. for a file with prefix blink_image. -b <path to Blink Image updates package> Specifies the path to the Blink Image updates package (blink_updates_<OSVERSION>.tgz). that should be executed and installed during the main installation process. refer to section "(8) How to configure the Blink mechanism -> The answers.xml file"). -a <path to answer.xml file> Specifies the path to the user's configuration file for unattended installation (if needed). -d <output directory> Specifies the output directory, into which the Blink image and all the other packages should be extracted. -x Specifies that Blink image should be only extracted, skipping the installation. This option is for advanced users that wish to configure an unattended installation - refer to Step 9 below. --reimage Using this flag will allow installation on machines that are already configured (performed First Time Wizard). By default, a snapshot of the old partition is saved, unless --delete-old-partition flag is supplied. --delete-old-partition Removes the old partition. Does not override the --keep-old-partition flag. A temporary directory /var/log/blink/launcher/files will be created. The main installation process will be started. A snapshot of the old partition will be saved. The Blink Image will be extracted in the specified output directory. The Blink Image updates package blink_updates_<OSVERSION>.tgz will be copied to the specified output directory. The user update shell script and binary files will be copied to the specified output directory. Validation for a configured machine will be skipped. A snapshot of the old partition will NOT be created. The Blink Image will be extracted to the specified output directory. If the output directory is not specified, then it will be extracted to the temporary directory /var/log/blink/launcher/files/. The main installation process will NOT be started. refer to the "(7) How to configure the Blink mechanism" section. Extract the desired user packages to the user_updates directory. in the installation_logic/answers.xml file (refer to section "(8) How to configure the Blink mechanism -> The answers.xml file"). Returns the last recorded status in JSON format. "statusDescription" : "The installation has finished successfully and is pending reboot!" Returns the last recorded status in a single-string representation. Returns the last status recorded identifier as a string. Reboot will be performed automatically. Connect with your web browser to the Check Point appliance to complete the First Time Configuration Wizard (basic mode only). This is an XML-based file (located in the installation_logic directory) that contains user's configuration for unattended installation. logging - Used in order to filter the logs saved to files, displayed on the screen or sent to the syslog. Colors - Should be set to true for displaying log messages in color on the screen. The root XML element is "properties". <installation> <reboot_delay> Specifies the delay (in seconds) before rebooting the appliance after completing the installation process. To suppress the reboot completely, define the value -1 (not recommended). <hostname> Specifies the appliance's HostName to configure during the unattended installation. <password_hash> Specifies the appliance's admin password to configure during the unattended installation. <network> <masklength> Specifies the appliance's IPv4 address subnet mask length (0-32) to configure during the unattended installation. <network> <default_gw> Specifies the appliance's default gateway to configure during the unattended installation. <admin_name> Specifies the username for the Security Management administrator. <admin_password> Specifies the password for the Security Management administrator. Password must be provided in base64 encoding. For example, if "file_level" is set to "ERROR", then messages marked as "Debug" and "Normal" will not be written to the log file - only messages marked as "Errors" and "Always" will be written to the log file. If "file_level" is set to "NONE", then no messages will be written to the log file. For example, if "screen_level" is set to "ERROR", then messages marked as "Debug" and "Normal" will not be displayed on the screen - only messages marked as "Errors" and "Always" will be displayed on the screen. If "screen_level" is set to "NONE", then no messages will be displayed on the screen. For example, if "sys_log_level" is set to "ERROR", then messages marked as "Debug" and "Normal" will not be sent to Syslog server - only messages marked as "Errors" and "Always" will be sent to Syslog server. If "sys_log_level" is set to "NONE", then no messages be sent to Syslog server. <password> This sub-subsection specifies the appliance's admin password to configure during the unattended installation. <network> <ipv4addr> Specifies the appliance's IPv4 address (X.X.X.X) to configure during the unattended installation. <network> <interface> Specifies the appliance's main management interface to configure during the unattended installation. <activation_key> Specifies the appliance's SIC one-time key to configure during the unattended installation. <cluster> Flag that specifies whether to enable cluster membership for the gateway or not. <user_updates> <entry_point> Specifies the main executable user shell script to call during the unattended installation, which will perform the desired operations. - Default value for "Management GUI Clients" property is set to "Any"
DP-2884 After upgrading to R80.20, using Blink images to downgrade is prohibited. DP-1644 Reimage: Blink reimage is blocked from running on VSX machines. No automatic Cleanup in case of un-normal progress interruption (power problem, early reboot, etc...). - Bond Configuration is not preserved during Blink installation.